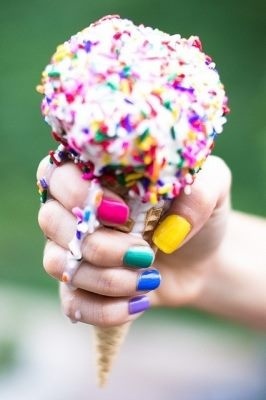 Spring nail polish often centers around sugary pastels reminiscent of candy and sherbet and this year is no different. My personal favorite trend of the season are the polishes inspired by birds with pretty feather or egg shell effects but if you are looking for something a little more dramatic try a steel blue polish such as Moon Rendezvous by Deborah Lippmann. I'm pretty obsessed with pastels for nails right now. You have some of my favorite colors up there! I love those colors! So fun and the picture with the ice cream looks amazing! So cute, i'm still in love with the mint green! So cute! I love these colours! I wanting to try the bird effects polish. I love lavender and mint! I've tried the Illamasqua speckle polish- it's pretty cute. This is a great guide! I'm really loving pastels of all colors! how amazing are those nails! what a great and inspirational picture! in this fantastic post I'm like..in heaven?!!! love this selection of gorgeous spring colors! Hi dear, how are you? Great post, there isn't a trend or shade I don't love, my eyes went straight to the yellows and mint first, so pretty. These are such beautiful hues! I LOVE Essie's Mint Candy Apple! Splash of Grenadine by Essie is my all time favorite color for spring/summer. I am into purples and nudes this season!! Such pretty shades! Hope you are having a wonderful day! wowza so many to choose from!! i'm really liking the pastel purples- it really goes with pretty much everything! I love the pastels - mint and lavender are my favorites! I love me some nail polish and when it comes to spring shades, I love pastels and brights. The multicoloured mani is so fun, reminds me of my nails as a kid! Thanks for putting this together! It's so great to have all these options in one place and linked! You gals are so great :) I really wanna try all those bird effect polishes! GOSH, they're so pretty! ymmy nails! ahaha! I like it, congrats! Aah thats lovely I love most of these colors. And yes spring is the best time to flaunt these crisp beautiful colors. Beautiful colours, i love it!